Deli is three pitches on great rock with great protection, but what else would you expect being on the West Face. The first pitch is 5.10 with a balancy crux coming about mid way up (120 ft). The second pitch is an enduro finger crack with no real crux, no real rest, and is a left foot killer (115 ft). The third pitch continues up a finger crack for about 30 ft until it dies, a couple of face moves bring you to a finger crack with jugs on the right face, great stances and great protection, place a piece and move to the face on good crimps for the last ten feet or so (90 ft). Hanging belays. Great protection the whole way, a couple hand size pieces are good for the bottom, .4s and orange master cams are handy for the second and third pitch, as many number 5 thru 9 stoppers as you can carry, bolts at each anchor. Anne Peick casually follows pitch 2. 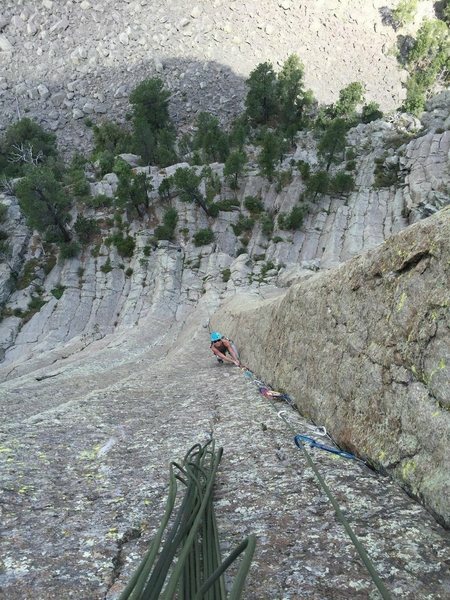 Climbed this route yesterday with Ben (who posted photo above). Pitch one was fun and had a delicate, balancey move getting to the anchor. Pitch two had amazing finger locks. I found it to be really sustained. Pitch three was overall far less sustained, but with a difficult, punchy little crux coming not far off the anchor.